Working on road jobs with lane closures, in between buildings or in traffic congested urban sites is always a challenge. Even more challenging is getting equipment with the power and control to get the job done without damage or safety incidents. The new Cat® 315F is designed to help you keep work in tight quarters productive and profitable. This compact-radius model features a tight 2.5 m (7′ 5″) front swing and 1.53 m (5′ 0″) tail swing radius, providing the ideal solution for space-restricted projects. Fuel efficiency. The Tier 4 Final C4.4 ACERT™ engine features two power modes and auto engine idle shutdown to conserve fuel and reduce emissions. Operator comfort. A ROPS-certified cab includes low sound levels, high visibility, conveniently located controls and an adjustable seat to keep workers productive all day long. Easy serviceability. Routine maintenance points at ground level with wide service doors facilitate easy access. Filters are also grouped to reduce service time. Durable design. A modified X-frame structure and robot-welded boom and sticks enhance excavator life, while a greased link between pins and bushings increases undercarriage longevity. Safe operation. Hydraulic functions can be locked with the push of the lever, and a handrail, anti-skid plating and countersunk bolts help to reduce slips. A rearview camera comes standard. Maximum versatility. Cat buckets and auxiliary hydraulics support a variety of optional tools, letting you do more with this machine. The Cat Pin Grabber Coupler reduces downtime and increases productivity by allowing any attachment with pins to be safely and easily swapped out and put to work in seconds. You can perform multiple duties without multiple excavators while sharing attachments across your fleet, helping you pull more profit out of every machine. 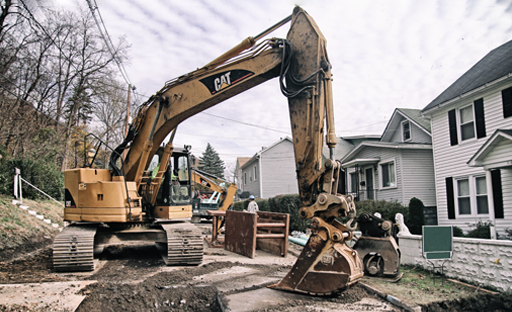 Learn more about the Cat® 315F compact-radius excavator.